The Department of Cardiology, Angiology and Internal Intensive Care at the University Hospital Saarland offers the full range of modern conservative and interventional cardiology. One of the specialization areas is the treatment of coronary heart disease. All modern invasive therapeutic methods are offered for the treatment of the disease, including directed atherectomy, cava filter implantation and implantation of modern stents with and without drug coating. The Chief Physician of the department is Prof. Dr. med. Michael Böhm. The department has three catheterization laboratories and one hybrid operating room where are annually performed about 5,000 catheter interventions, such as revascularization for ischemic heart disease, minimally invasive treatments for mitral and aortic valves (TAVI and Mitraclip), sampling of the heart muscle tissue for histological examination, closure of the atrial auricle and atrial septal defect, renal artery revascularization, as well as interventional therapy for hypertension treatment. The department also provides 24-hour interventional cardiac care for acute coronary syndrome. The Department of Electrophysiology offers the whole spectrum of conservative and interventional treatment for heart arrhythmias. These include the implantation of pacemakers and defibrillators, catheter ablation (radiofrequency ablation, cryoablation) for various types of tachycardia. The Heart Failure Unit specializes in the treatment of patients with severe heart failure and is one of the first Heart Failure Centers in Germany, certified by the German Society of Cardiology. Along with conservative therapy of heart failure, in cooperation with the Department of Cardiac Surgery, there is offered the implantation of left heart support systems. The Department of Angiology is part of the interdisciplinary University Vascular Center and, jointly with the Department of Vascular Surgery and the Institute of Radiology, offers a comprehensive diagnosis and treatment of vascular diseases. 1977 - 1984 Study of Medicine at the Hannover Medical School. 1979 - 1981 Dissertation in the Center for Toxicology and Pharmacology at the Hannover Medical School. 1982 Internship at Tufts University in Boston, USA. 1984 - 1986 Research Assistant n the Department of General Pharmacology at the University Hospital Hamburg-Eppendorf. 1986 - 1993 Research Assistant in the Department of Therapy, Ludwig Maximilian University of Munich. 1993 - 2000 Senior Physician of the Department of Internal Medicine, University of Cologne. Since 1995, Professor of Internal Medicine and Cardiology, University of Cologne. 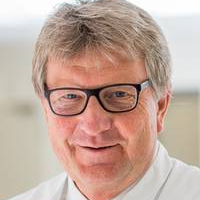 Since 2000, (C4) Professor of Internal Medicine in Cardiology/Angiology and Medical Director of the Department of Internal Therapy III, Cardiology, Angiology and Internal Intensive Care, University Hospital Saarland, Homburg/Saar.